Cable, broadcast, and Spanish language news networks largely ignored an “epidemic of deadly violence” against the transgender community in the first two months of 2015, despite devoting coverage to various transgender stories. When networks discussed transgender issues, they often failed to include the voices of transgender individuals, especially transgender women of color. Who Included Transgender Guests In Their Coverage? 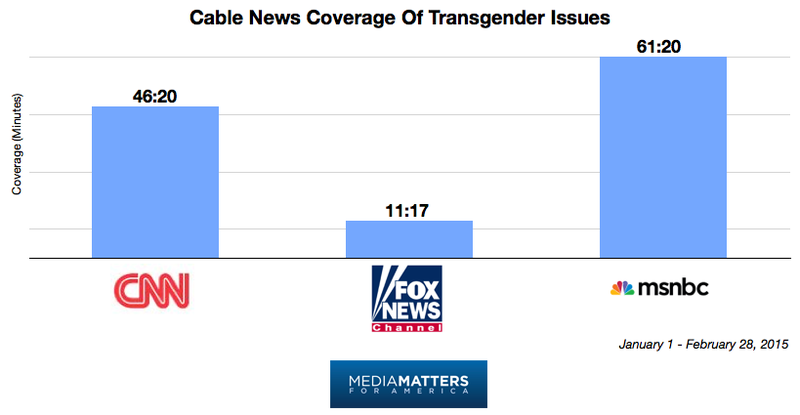 Which Networks Covered Transgender News Stories? Nearly Half Of MSNBC’s Coverage Occurred During Ronan Farrow Daily, Which Was Cancelled In February. Of MSNBC's sixty-one minutes of coverage of transgender issues, just over twenty-nine minutes were from Ronan Farrow Daily. The show was cancelled on February 27. Over Half Of CBS’s Coverage Came From A Segment Discussing Amazon’s Transparent. 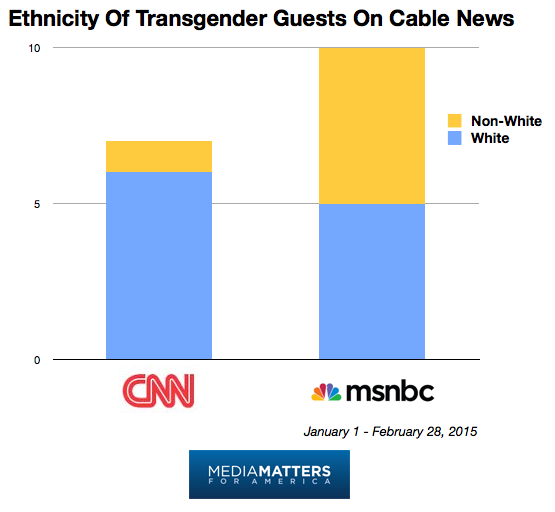 82 Percent Of CNN’s Coverage Of Transgender Issues Was Devoted To Jenner's Transition. Nearly Half Of Fox News’ Coverage Was Dedicated To Criticizing CUNY's Gender-Neutral Memo. Four minutes of Fox News' eleven minutes of transgender coverage were spent criticizing the Graduate Center of the City University of New York (CUNY) for a memo suggesting that staff avoid using gendered salutations in corresponded with students. National News Networks Largely Ignored The Murders Of Seven Transgender Women Of Color. ABC, CBS, Fox News, MSNBC, and NBC ignored the murders of seven transgender women of color during the first two months of 2015. CNN’s Don Lemon briefly mentioned the murder of three of the women during a discussion about Bruce Jenner during the February 5 edition of CNN Tonight. Neither Spanish- Language Network Mentioned Transgender Issues During Their Sunday News Shows. Neither Univision's Al Punto nor Telemundo's Enfoque featured a discussion of transgender issues during the first two months of 2015. Neither Spanish- Language Network Mentioned Violence Against The Transgender Community. Neither Univision nor Telemundo discussed the murders of seven transgender women of color or the issue of violence against the transgender community in the first two months of 2015. 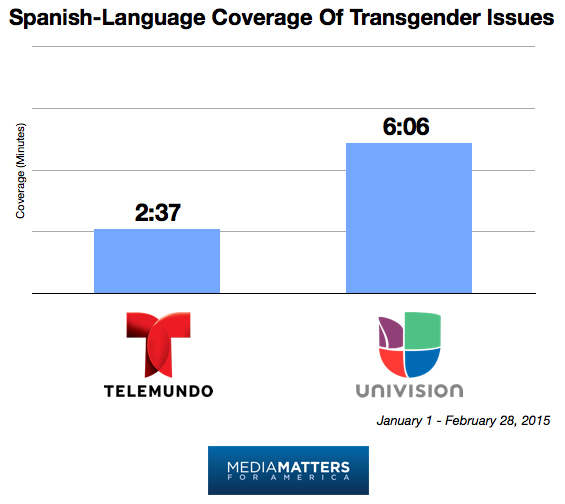 Both Spanish- Language Networks Featured Transgender Individuals During Their Coverage. Univision and Telemundo both featured transgender guests during their coverage of transgender issues - activist Maggie Sanchez during the February 9 edition of Noticiero Telemundo, activist Marichuy Leal Gamino during the January 28 edition of Univision’s Edicion Nocturna, and a transgender woman during the February 10 edition of Noticiero Univision. The same search was run in Spanish for Univision and Telemundo using TV Eyes and IQMedia. Reruns and teases for upcoming segments were excluded. Mentions after midnight but before the beginning of the next day’s news cycle were excluded. For broadcast networks, we limited our search to the regular morning and evening newscasts, excluding shows like 20/20 and The View. 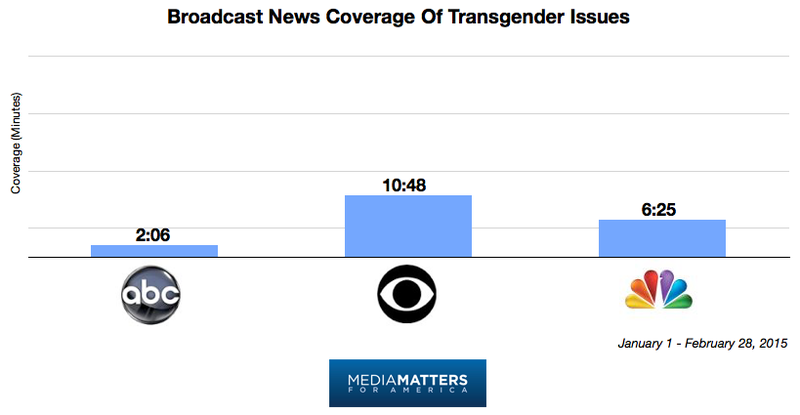 Transgender coverage included any intentional, network-prompted mention of a transgender news story or individual. Mentions made by guests were excluded. Passing mentions, like references to Amazon.com’s “Transparent” winning a Golden Globe or offhand remarks about Bruce Jenner’s appearance were not included. 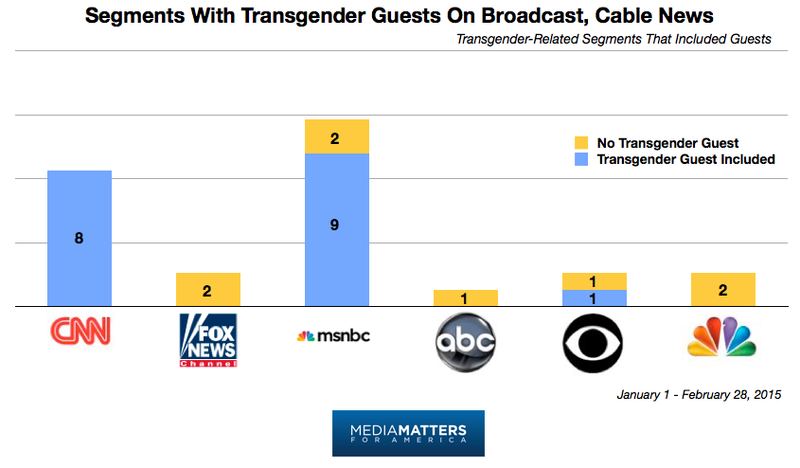 To measure how often transgender guests were invited on the networks, we considered all transgender-focused news segments that included commentary from guests. Segments that aired pre-recorded clips of transgender individuals commenting were counted as having a transgender guests. Network correspondents were not considered guests. Foreign nationals were excluded from the diversity analysis. This applied to only one guest, Diego Neria Lejarraga, the transgender man who claims to have had a private audience with Pope Francis. He appeared on the January 31 edition of CNN Newsroom. — C.L., C.M., & R.P.